How to make embedded subtitle to a movie? How to add SRT subtitle to a video? How to add closed caption to a quicktime movie? How to add soft coded subtitle to a movie? How to add subtitle track to a mp4 or mov? How to add multiple language subtitles to your video? With Subtitle Writer, it’s a snap to add subtitle track to your movie and video. Of course, it’s working for iPad and iPhone movies. You can easily watch multi language subtitled movie on your Mac, iPhone and iPad. It’s not hard coded and no video quality loss. You can turn the subtitle on or off. 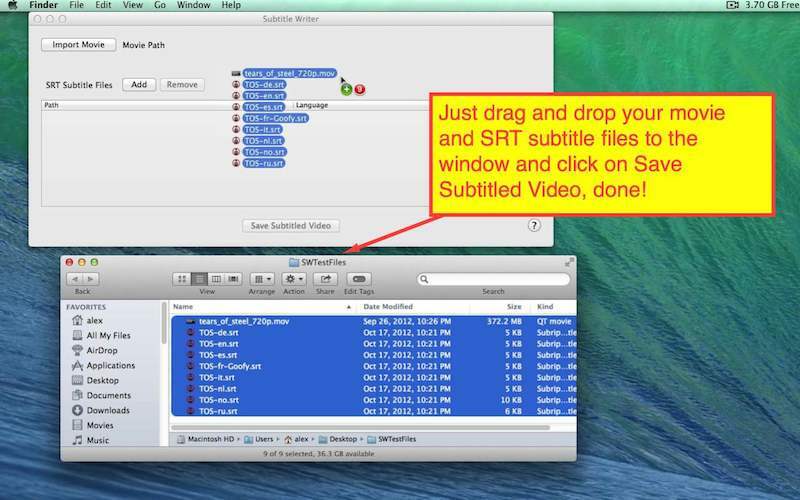 You can even extract the subtitles to a SRT file by using SRT Extractor on Mac App Store. Visit http://www.finalsub.com/subtitlewriter.html to learn more before you buy it. -Mov, m4v, mp4, 3gp are supported. iOS video format supported. -Soft coded subtitle. No video quality loss. -Multiple subtitle tracks burn to video at one time. 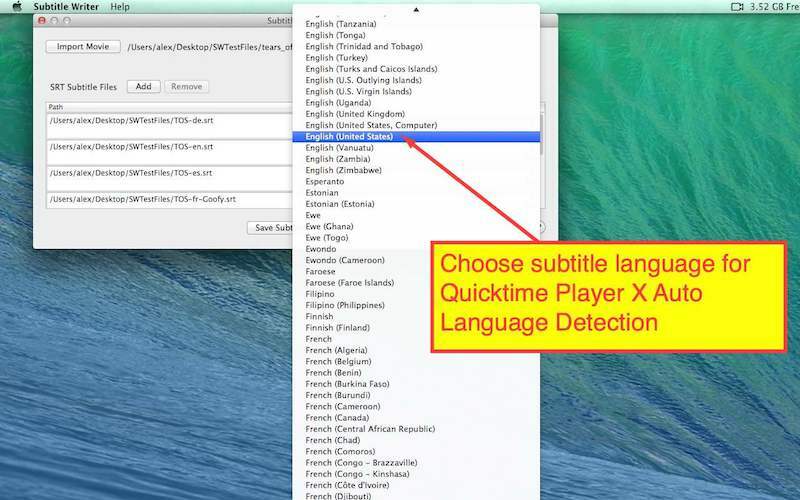 -Choose language for Quicktime X auto language detection. -Mac OS 10.9 or above. 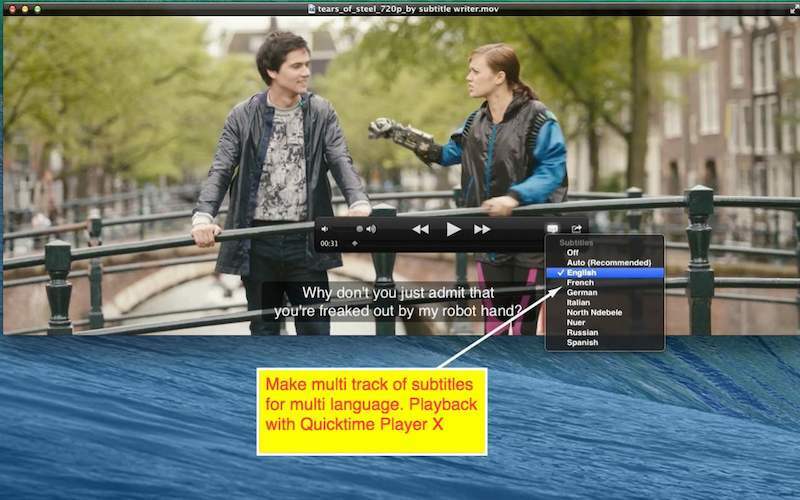 -Use Quicktime X to toggle CC on on Mac to see the subtitles. -Turn on Closed captions on iPhone and iPad to see the subtitles. -You can Download SRT Extractor to extract the subtitles from video. -You can download SRT Edit to make new SRT file or edit an existing SRT file. -This Subtitle Writer Version 1.0 only support Quicktime Player X. Quicktime Player 7 is not supported to see the subtitle track. -If you want to add subtitle for iOS compatible video, make sure your video format is ready for iOS devices. If not, please use video converter to make it iOS compatible. Then add subtitles to the video. -On iOS device, please turn the Closed Captions on by Settings->General->Accessibility->Subtitles & Captioning ->Closed Captions+SDH. This entry was posted in FinalSub News and tagged closed caption, movie, quicktime, srt, subtitle, subtitles, text track, video. Bookmark the permalink.